Take Exit 11 (Millbury, Rt. 122), turn right onto Rt. 122 South. Proceed a little over 2 miles, during which time Rt. 140 will merge in from the left, and you will then pass under the Mass Pike. At the base of a down grade, look for Wheeler Road on the right. If you reach the Stop & Shop you have gone too far. Turn right on Wheeler Road. 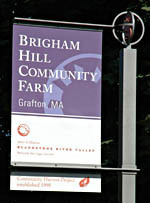 Follow Wheeler Road up the hill until near the point where it ends at North Brigham Hill Rd. You will see the farm on the left.